At the heart of Silicon Valley, San Francisco is one of the wealthiest cities in the country. It demonstrates that homelessness is not primarily an economic problem but a symptom of drug abuse, which in turn is a symptom of degeneracy and irresponsibility at both the personal level and the government level. On tips from Varla and Pork_Soda. On tips from Varla, 1-Bodhisattva, and Becky in Washington. Hat tip: Power Line. Tourists staying at the nearby Hilton San Francisco Union Square might have been able to watch this out their window — assuming that rapidly decaying San Francisco still has tourists. There was a time when it would have been unthinkable that you would see a savage beat someone possibly to death (the victim’s injuries are considered life-threatening) in the middle of town (Ellis Street between Taylor and Jones, near Market Street) in broad daylight and walk away unmolested. Those were the dark ages, when everyone was a bigot, unenlightened by political correctness. At least Melton Earl Kelly was later arrested for this crime. Not even San Francisco has hit rock bottom quite yet. Last week, the mayor announced a detailed plan to direct a $181 million cash windfall the city received from the state to homelessness, affordable housing and related problems. The proposal includes nearly $20 million to be spent on beds for patients who have addiction and mental health problems. Spending money on the homeless unsurprisingly draws the homeless and exacerbates the problems they cause. In Los Angeles, doubling the homeless budget increased homeless crime by nearly 50%. San Francisco may also see an influx of cash to help solve the crisis, after a controversial ballot measure passed in November. Known as “Prop C,” the measure is viewed as a “homeless tax” — it aims to raise $300 million a year to spend on homeless services by taxing big businesses. 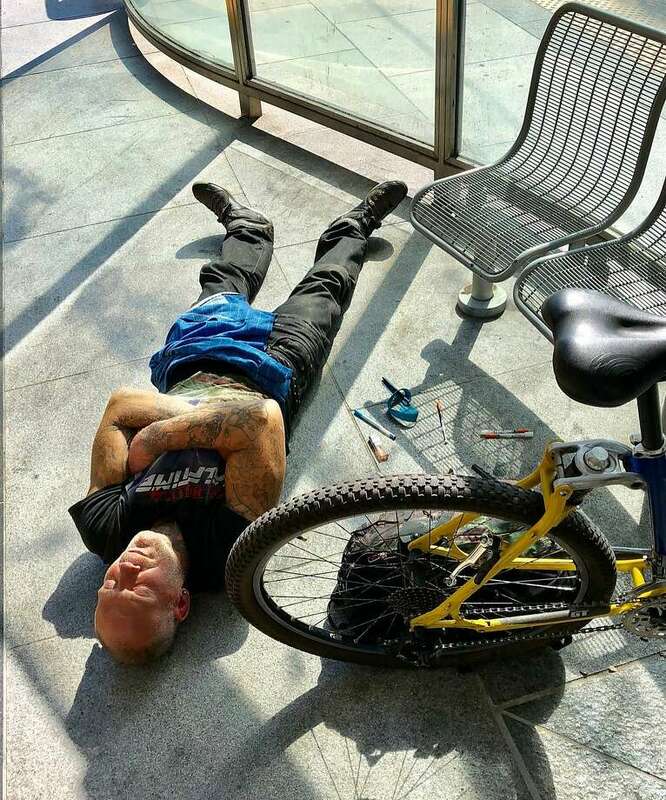 The city already provides junkies with 4.45 million free needles per year. Now Mayor London Breed wants to offer taxpayer-funded shooting galleries (a.k.a. “safe injection sites”), staffed with healthcare workers. If abortion is healthcare, then so is helping junkies shoot up. Don’t let this happen to your town. Block moonbattery at every opportunity. On tips from 1-Bodhisattva and Dragon’s Lair. Residents of San Francisco’s North Beach neighborhood packed a community meeting on Monday night to voice their concerns about the concurrent increases of both homelessness and crime in the area. The situation has escalated beyond having to wade through the human waste that piles up on the sidewalks. Reports of mentally ill homeless people committing a variety of crimes in San Francisco have increased in recent months. Some of these crimes include the homicide of a store clerk and the random stabbing of two people with scissors just down from the crooked section of Lombard Street. Consequently, the crowd at the community meeting was standing room only. Looks like not much was accomplished other than venting. Instead, authorities have been rolling out the red carpet for bums and junkies, shoveling hundreds of $millions of other people’s money at the homeless and passing out free needles. Mayor London Breed has been pushing for city-sanctioned shooting galleries. You see what San Franciscans get for electing moonbats. Let the ruin of their city be a lesson to us all. Auto burglaries in San Francisco are out of control. No one dares leave anything of value in their car. The story of 21-year-old Deshawn Patton illustrates why this might become such a serious problem in a city run by moonbats. After a year-long crime spree that occurred while he was already on two separate probations for a previous car break-in and for a felony burglary, Patton was indicted on 11 felony and nine misdemeanor charges, which include eight counts of auto burglary and one of hit and run causing injury. Young Deshawn was caught in the act multiple times, but he usually managed to escape, employing tactics such as ramming a police car with officers in it. No doubt he is a nice boy who plans to go back to school and maybe also become rap star. So Superior Court Judge Christopher Hite will let him off easy. Hite is perhaps best known for flushing all 64,713 outstanding warrants issued in quality-of-life cases from January 2011 through October 2015, giving police no authority to detain people who skipped court appearances and rendering the citations meaningless. The judge is a moonbat. Incidentally, he is also a Person of Politically Preferred Pigmentation, like young Master Patton. Probation doesn’t seem to work on Deshawn. This time is unlikely to be different. We will probably never know, because only 1.6% of reported car burglaries result in arrest. The deal isn’t final. Outraged members of the public keep showing up at the hearings, and Hite keeps kicking the hearings back. The next one is scheduled for October 3. Patton will almost certainly walk free. Patton mainly preys on the rental cars of tourists. No wonder tourists and conventions are learning to stay away from San Francisco. Needles used by dope fiends and financed by taxpayers cover the streets of San Francisco, presenting a conspicuous health hazard. Eventually, offering straws even on request will get them in trouble. As of next July 1, single-use straws will be illegal in San Francisco. Napkins will be available upon request or at self-service stations — for the time being. As progressivism continues to progress to its logical conclusion, before long everything conceivable will be either publicly funded or banned. In an attempt to attract employees to local restaurants and businesses, Supervisors Ahsha Safaí and Aaron Peskin are co-sponsoring an ordinance that would ban “employee cafeterias” from new office buildings in the city. The cafeterias exist as a perk to attract employees. Before long, tech companies will have to locate somewhere else if they want to compete in that regard. Even notoriously moonbattery-prone techies could get force-fed to the teeth quickly if compelled to interact with the community dominating San Francisco’s streets. “It breaks my heart, and it took me 30 minutes before I decided to post it,” Perry said. Drawing attention to the social decay that liberal policies have allowed to get completely out of control does not make San Francisco look good. But in the long run, ignoring it as it continues to fester and escalate will make the city look even worse. •	Laws against public drug use and public defecation are not enforced. •	Government incentivizes the homeless junky lifestyle. •	There is no expectation that the underclass should take some responsibility for its behavior. Don’t let this happen to the rest of the country. On tips from Lyle and StephaneDumas. “I work hard to make sure your programs are funded for the purposes of trying to get these individuals help, and what I am asking you to do is work with your clients and ask them to at least have respect for the community — at least, clean up after themselves and show respect to one another and people in the neighborhood,” Breed told the Investigative Unit, referencing her conversations with nonprofit groups aimed at serving the homeless. While the homeless persons are getting their talking-to, maybe they could also be told to lay off the heroine and get jobs. The city has been spending hundreds of $millions per year on homeless people, yet — mystifying to moonbats — the homeless population is not going down. “It’s the first time that we have had an out-and-out cancellation over the issue, and this is a group that has been coming here every three or four years since the 1980s,” said Joe D’Alessandro, president and CEO of S.F. Travel, the city’s convention bureau. The first time will not be the last time, if current trends in Pelositown continue. They aren’t saying which association it is, but the initials are likely AMA. Chicago is mentioned as the headquarters, a major clue. The group’s annual five-day trade show draws 15,000 attendees and pumps about $40 million into the local economy. … [P]ostconvention surveys showed their members were afraid to walk amid the open drug use, threatening behavior and mental illness that are common on the streets. Tourism is San Francisco’s biggest industry, bringing in $9 billion a year, employing 80,000 people and generating more than $725 million in local taxes — conventions represent about $1.7 billion of the business. You might get away with leaving moonbats in charge for a while, but never indefinitely. On tips from 1-Bodhisattva and Chuck A. “I’d been there for probably less than a day, just wandering around the center, and already seen more than enough poverty and suffering to cause me wanting to leave desperately,” wrote another visitor from London in 2017. You don’t have to come from abroad to notice that San Francisco is a sewer. If only Harry Callahan were around to clean it up. But the dinosaurs (as he was called by a moonbat in The Enforcer) have been weeded out long ago. There is nothing left now but touchy-feely liberalism and its inevitable consequences. This is the city that provides Democrats with their leader in the House of Representatives. On tips from Dragon’s Lair, Steve T, and Steve A. The ban takes effect Jan. 1 and applies to apparel and accessories featuring real fur, including coats, key chains and gloves. A lucky rabbit’s foot won’t be so lucky if authorities catch you selling it in San Francisco, a city that imposes the flaky notion of animal rights so repressively that it is against the law to sell cats and dogs unless they are “rescue” animals. The San Francisco Chamber of Commerce estimates that fur sales contribute $40 million per year to the local economy. Authoritarian virtue signaling doesn’t come cheap. The same screwball totalitarians who elected this Board of Supervisors sent Nancy Pelosi to the House of Representatives, where she has been the top Democrat (either Speaker or Minority Leader) for more than a decade. If you want to live in a rigid moonbat dystopia, there is no need to move to San Francisco; just vote Democrat and wait a few years. Never mentioned is the fact that the fugitive Armando Nuñez-Salgado has already been deported four times. His daughter won’t have to wait long before he turns up in this country once again, like a bad penny. On a tip from roccolore. for the first time in a long time, more people are leaving the Bay Area than are coming in. The reasons given include unaffordable housing, crime, and politics. These boil down to one reason: politics. Liberal rule has made this sanctuary state a worldwide magnet for lowlife, and has prevented developers from meeting housing demands. Escaping Californians are welcome, but rest of the country has to ask that they leave the moonbat politics that made their state unlivable behind. On tips from Bodhisattva and Mr. Freemarket. San Franciscans who can’t pry their noses loose from their phones even as they walk down the street will find this indispensable if they want to keep their shoes clean. On tips from Byron and Zack VC. A robot patrolling a street in San Francisco to ward off homeless people has been removed after complaints from locals, who also knocked it over and smeared it with feces. These days feces go with San Francisco the way cars used to go with Detroit. The Knightscope K5 security robot was deployed by the San Francisco branch of the Society for the Prevention of Cruelty to Animals (SPCA) to deter homeless people from sleeping and loitering near its building. [The SPCA] was forced to take away the 400-pound machine as it was operating in the public realm without a permit, and threatened with a $1,000-a-day (£745) fine. The same bureauweenies do nothing to prevent the bums who have been washing up there since the hippie days from turning the otherwise beautiful city into an open sewer and menacing employees as they try to come and go at work. The robot’s nickname is K9. Presumably the SPCA has real canines at its disposal. Maybe a few Doberman Pinschers could be trained to keep the entrance clear of derelicts. BART [Bay Area Rapid Transit] police are looking for a man who drew offensive images on the floor at the San Francisco Embarcadero BART Station earlier this week, police said. The suspect is seen wearing a Star Wars hoodie. Fortunately, a picture is also included, on the off chance that the suspect has other clothes besides the hoodie. The picture won’t surprise anyone familiar with the Hate Hoax List. On a tip from Steve A. Hat tip: Cristy Li. Mostly it will be dog crap. Tuffington, a 45-year-old artist and designer, created a Facebook event page based on the concept, and the dog owners of San Francisco responded in droves. Many have declared their intention to stockpile their sh**piles for days in advance, then deliver them in bags for the site. Elected officials lobbied unsuccessfully to get the National Park Service to deny Patriot Prayer a permit for the free speech rally. As with the war on history, what cannot yet be done legally through the bureaucracy is accomplished at the street level by the most unsavory people imaginable. BTW, not even the Southern Poverty Law Center lists Patriot Prayer as a hate group, even if local Congresscritter Nancy Pelosi demagogues by calling it “white supremacist.” Founder Joey Gibson has explicitly denounced white supremacists and neo-Nazis in the harshest terms, and plans to exclude extremists from the event. He is an admirer of MLK. The stated purpose of his group is to use “the power of love and prayer to fight the corruption both in the government and citizen levels that seek to gain power through division and deception.” Four groups of leftist counterprotesters have been given permits to confront this single right-of-center group. Yet Democrats and the media are making the event out to be Kristallnacht. When “antifascists” start fights, you know who will be blamed. Yet liberals preach that we should be more tolerant and diverse. On tips from Gary, Bodhisattva, and Torcer.